The Philippine Travel Mart (PTM) which is an annual exposition that promotes nationwide tourism destinations, products and services is getting bigger. It is moving up to a bigger venue at the SMX Convention Center, Mall of Asia Complex in Pasay City held annually the first week of September. Among the highlights of the Philippine Travel Mart are the exciting tour packages from emerging destinations especially from the Eastern Visayas. Department of Tourism Region 8 Director Karina Rosa Tiopes informed that just recently, PHILTOA (Philippine Travel Tour Operators Association) conducted a familiarization tour in the Region where the participants explored the hidden tourism gems in the provinces of Leyte, Southern Leyte, Biliran, Samar, Eastern Samar and Northern Samar. 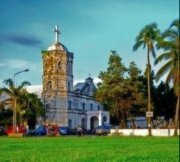 The tour package includes visit to the Kalanggaman Island in Palompon, Leyte which features one of Philippines most beautiful beaches; and a walk along the Heritage Lane of Baybay City in Leyte where well-preserved colonial era ancestral houses are located. One of the hidden tourism gems is the excitement of snorkeling at Padre Burgos in Southern Leyte which is said to be one of best dive spots in Southeast Asia. Still in Southern Leyte, this time at Macrohon town, one will have a time of his life at the Kuting Reef. Not to be missed are the majestic Biri Rock Formation in Northern Samar as well as the ABCD Beach in Calicoan Island in Guiuan, Eastern Samar. The various tourism councils and Local Government Units in Eastern Visayas, to include among others, the Provincial Government of Leyte, Provincial Government of Samar and the City of Tacloban are giving full support for the successful promotion of Eastern Visayas at the 22nd PTM, Director Tiopes said. Aside from featuring Eastern Visayas tour packages and other tourism destinations nationwide, that can be enjoyed at low rates along with irresistible travel packages to the Philippines' most breathtaking places, visitors at the PTM will also be treated to cultural performances showcasing the beauty of the Filipino Culture. The Philippine Travel Mart continues to be the premiere and biggest travel and tourism trade show in the country.